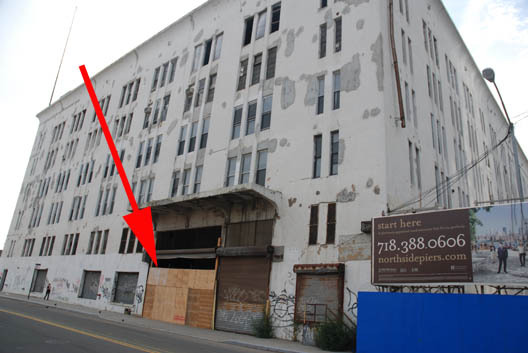 With all the attention that's been paid to the Austin Nichols Warehouse at 184 Kent Avenue in Williamsburg, it's worth noting that early work is underway on the significant alteration and conversion of the building to more than 300 luxury apartments. The big steel door in the front of the building has been removed and replaced with plywood. Several permits have been issued over the last several months, with the most recent coming at the end of July. The building has been empty for more than a year and we noted the future look only last week.